CLEVELAND, OH March 14, 2018: W.F. Hann & Sons, the area’s largest residential HVAC company with a fast-growing commercial HVAC division, has just named its first woman president in the firm’s 110 year history. The company’s new president, Karen Johnson, brings nearly 30 years of business experience to her new position. With W.F. Hann since 2010, Karen joined the company as Controller and most recently served as the company’s Chief Operating Officer. “Karen’s extraordinary work ethic and dedication to our company’s success has earned our trust and confidence. With Karen as our new president, I feel confident that our customers and our employees will be well served,” explained co-owner Carl Grassi. Karen, who makes her home on Cleveland’s east side, has five children and a new grandson. Karen is also mother to Louie, her new puppy who not only has the run of the corporate office but has also been prominently featured in the company’s TV commercials. 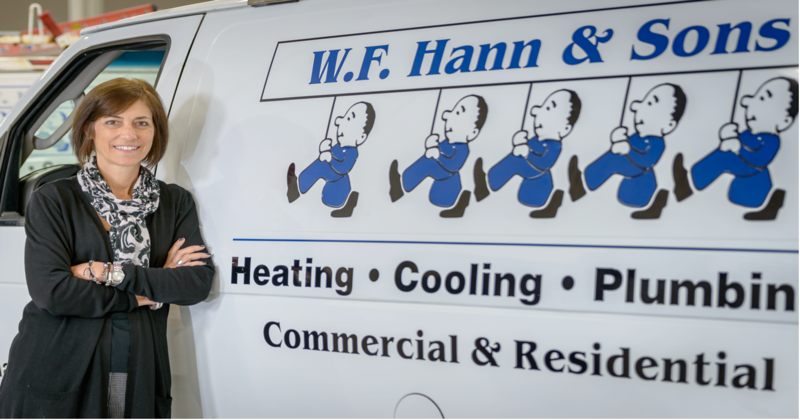 Since 1907, W. F. Hann & Sons has delivered heating, air conditioning and plumbing service to homes and businesses throughout Northeast Ohio. For three years in a row, W.F. Hann & Sons has been selected as one of the Cleveland Plain Dealer’s Top Workplaces. Additionally, W.F. Hann is the only dealer in Northeast Ohio to receive the 2015, 2016, 2017 and 2018 President’s Awards…Carrier’s highest distinction for its dealers and an example of true excellence. The company is a member of the Better Business Bureau and a nine-time recipient of the Angie’s List Super Service Award. W.F. Hann & Sons is headquartered at 26401 Miles Road, Warrensville Heights, Ohio 44128. 216.831.4200 or 877.516.4200.